In this chapter we concentrate on the status of sediment, sources of siltation, sediment Information, also concentrates on the process of setting up monitoring program for the purpose of providing a valid data base for sediment water quality assessments, and modeling. Also the choice of variables to be measured in the water, the sediment in biota and the common procedures for data handling. 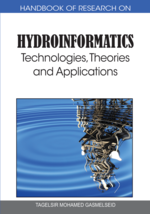 This chapter concentrates on the existing process of monitoring programmes for interpretation of these data for the purpose of assessing sediment water quality in rivers, and reservoirs, also focus on monitoring strategies requirements for water quality data and interpretative techniques. The choice of the appropriate methods is illustrated by case studies for typical water pollution situations, beside the strategies for sediment water quality assessment. Within the range of water quality issues addressed in this chapter efforts have been concentrated on major areas of vital importance. Monitoring, analysis is done usually as part of the quality control program for drinking water. It concentrates mainly on (Daily, and monthly base) physical parameters mainly suspended sediment and turbidity. While for sediments transport concentration and load, they adopted stations along the Blue Nile and within Al Gezira scheme only, so establishment of National Monitoring Network for sediment monitoring covering all the Nile system highly recommended. Turbidity and suspended solids imposes the major constrains on the development of surface water for domestic use, where silt content exceeds the designed capacity of the treatment plants and their efficiency drop to almost half, and water contamination risk increases. Also due to continuous deforestation, and erosion in the catchments areas, the turbidity of rivers and seasonal streams increase by up to 50% per decade. The sediment creates many difficulties and problems to Sudan, at the same time, it has its negative impact on the Ethiopian Highlands, from where it originates, and degraded the land by erosion and reducing its productivity. Assessment of River Nile and its tributaries, show that the maximum value recorded of suspended solid load in Blue Nile during the flood season approximately 22 kg/m3. The sediment carried annually by the Nile River was averaging 110 million tons as measured in Aswan. However, since the 90s the average increased to about 40 million tons (HRS, 1996), during the last ten years the maximum sediment concentration increased to about 8500 ppm, (45% sand, 15% silt and 40% clay). The Nile water requires careful management to support sustainable development and avoid excessive abstraction, contamination and environmental degradation. To achieve these objectives it needs proper assessment, control and protection in short and long term perspectives. Establishment of adequate monitoring networks can help in solving these problems by implementation of most efficient tools to delimitation of vulnerable zones to siltation and sedimentation. Several models were developed to assess and quantify the impact of land management on water, sediment, nutrients and pesticides at field scale as well as at small watershed scale. Water resources in Sudan are heavily utilized by densely populated communities, but its availability and sustainability in supply the needs of growing population is a problems. Water supply in Sudan is obtained from River, seasonal streams, rain water collected in Haffairs; earth Dams, irrigation canals, ground water by boreholes and open shaft wells. The total of water available about 76 million cubic meter, the water which should be provided is 153 million cubic meter, this deficit should be provided from surface water, but quality of surface water is very low. The River Nile and its tributaries display the most prominent physical and geographical feature of the country. The White Nile originates mainly from the Equatorial lakes on the lake plateau; it leaves Lake Albert as the Albert Nile and continues northward into- Sudan. At Khartoum the White Nile joins the Blue Nile which originates from the Ethiopian Plateau and form the main Nile at Khartoum. The main Nile joined by River Atbara., before flowing north to the high Aswan Dam Reservoir. The Nile acts as the spinal cord for any sustainable socioeconomic development of the riparian countries. The prevailing good environment conditions of wide Nile basin and valuable source of water should be used to maximize benefits and improved livelihood. Water quality means different things to different persons because of the various perspectives from which they approach it. Generally, it refers to characteristics or attributes of water, good or bad, that relate to its acceptability for certain purpose or uses. From a technological point of view, those characteristics usually are defined in terms of appropriate physical, chemical, and biological parameters. Due to its flashy and rapid nature of the Blue Nile, Atbara, Dendir, and Rahad rivers carry annually huge load of Sediments affects negatively the capacity of water storage facilities and canals. More over it increases turbidity which increases the cost of water treatment for drinking and causes blockage of the hydropower generation turbines and dams gates. Particulate matter is derived primarily from rock weathering processes, both physical and chemical, and may be further modified by soil-forming processes. Particulate matter (PM) refers to particles greater than 0.4 micrometer (μm). By this definition dissolved matter includes particles finer than 0.45 micrometer (μm), including colloids. Erosion subsequently transfers the sediments or soil particles from their point of origin into freshwater systems. During transport, the sediment is sorted into different size ranges and associated mineral fractions until it is deposited on the bottom of the receiving water body. Sediment may then be re suspended and transported farther afield, by intermittent storm activity until it comes to its ultimate resting point or sink, where active sediment accumulation occurs. Modification of the composition of sediments may occur as a result of the input of Autochthonous organic and inorganic particles (calcite, iron hydroxides). Particle size and mineralogy are directly related because individual minerals tend to form within characteristic size ranges. Sediments may thus be described in terms of discrete compositional fractions, the overall characteristics of which are due to the variation in the proportions of these fractions and the consequent changes in particle size. Once polluting substances are introduced into a river, they are transported and transformed by physical, chemical, biological and biochemical processes. It is important to understand these various pathways in order to achieve the best sampling design and to determine the impact of the substance on the water system and the rates at which elimination may occur. Sampling and analytical strategies for river assessments must be related to the present and future water uses. Two major concepts must be recognized in the design of assessment programmes which address water uses. Multiple use of river water may occur within any region of the river basin. Each use has different water quality requirements and user conflicts may occur. Ideally, water quality should meet the most stringent use requirements which, in virtually all cases, are the provision of good quality water. There is always a responsibility for upstream users to ensure adequate water quality for the needs of downstream users. Multiple use of a river system necessitates careful design of assessment programmes to ensure that the requirements of individual uses are accommodated in the monitoring strategy. Contamination: Introduction of substances make the water unfit for its intended use. Trans-Boundary: Involving one, two or more countries. AGNPS: Agriculture Non Pollution Model, use a distributed group response unit approach for water quantity and quality modeling, runoff, sediment yield and soluble nutrient concentrations are calculated separately for each land cover class, weighted by area and then routed down stream. Water Pollution: Refers to a condition of water within a water body caused by the presence of undesirable materials. Cross- Border: Effects only being felt across the border. Water Quality Monitoring: Long -term program to establish status or trends. Basin Wide: Pertaining to the whole Nile Basin (10 countries). WQ Assessment: Full process of monitoring, data evaluation and reporting. Particulate Matter (PM): Agriculture Non Poi-Refers to particles greater than 0.4 micrometer (µm), by this definition dissolved matter includes particles finer than 0.45 micrometer (µm), including colloids.